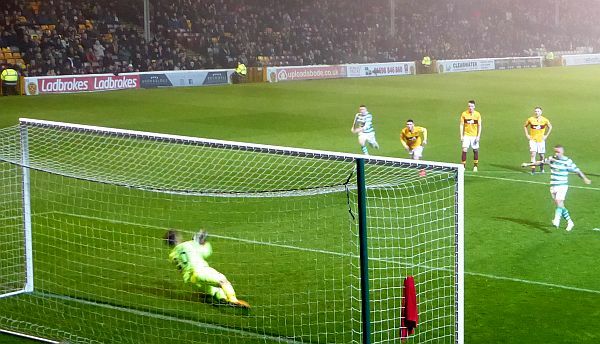 Motherwell’s never say die attitude proved to be enough to earn a draw against Celtic under the Fir Park lights. A penalty save from Mark Gillespie and a late equaliser from Danny Johnson gave the home crowd plenty to cheer. The result was all the more remarkable given that Stephen Robinson had to make two early defensive substitutions when both Peter Hartley and Liam Donnelly limped off inside the opening fifteen minutes. Resources were stretched even further when Adam Livingstone, Donnelly’s replacement, suffered a calf strain with twenty minutes remaining and joined the queue for treatment. The manager made four changes from the team that disappointed at Livingston with McHugh, Hartley, Sammon and Donnelly starting for Main, Bigirimana, Mbulu and Maguire. The game stared under a cloud of smoke from the pyrotechnics in the South stand but we fell behind while Donnelly was being assessed at the sideline. Christie waltzed through our defence and finished well. The omens were not good. Celtic controlled possession and we had to adjust to the unexpected changes. We held on without much in the way of a goal threat but conceded a penalty five minutes before the break when Andy Rose gave Christie the chance to hit the deck when there was no threat on the dead ball line. Griffiths stepped up to take the spot kick but Gillespie was up for it. He stopped the shot and punched the loose ball to safety. Campbell had a blast from 20 yards five minutes into the second half as we made an occasional visit to the Cooper goal. The visitors kept the ball for long spells but they rarely tested Gillespie. It looked like our chance of stealing a point had disappeared in the 81st minute when Sammon ended a 20 yard run with a decent effort that was save by Gordon. But we were to fashion one more opportunity. A long ball down the left broke to Danny Johnson. He collected, moved in to the box and from a narrow angle sent the ball beyond the long arms of Gordon to cross the goal line at the far post. The equaliser was a fitting reward for the great attitude displayed by all in claret and amber. A similar display at Tynecastle may get a reward on Saturday.